Jeremiah Adams was born on Thursday, March 17, 1994 at Edward Hospital in Naperville, IL, to Stephen and Christine Adams (nee Gibson) of Aurora, IL. He was welcomed into the world by his three older brotehrs, Matthew, Michael, and Joshua, and just under two years later, welcomed, with his brothers, his sister Rebekah. 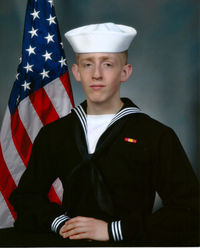 Jeremiah graduated from Oswedo East High School in 2012, and enlisted in the United States Navy. He reported to RTC Great Lakes for Boot Camp on April 23, 2013. He graduated on June 21, 2013, and reported to 'A' School in Charlestown, SC, where he also attended Nuclear Power School and Prtotype training. Upon graduation, he was assigned to the USS Nimitz, where he served as a Electrician's Mate, Nuclear, until his untimely death on May 4, 2018.